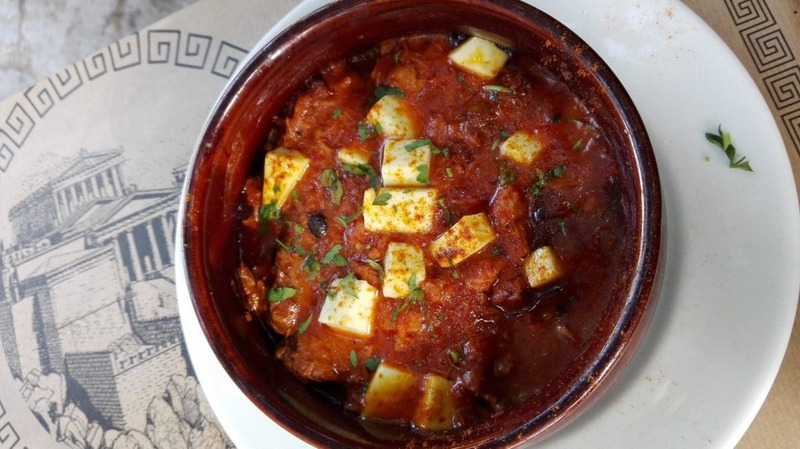 Besides moussaka, giouvetsi (Γιουβέτσι pronounced as ‘you-vet-si’) is also a famous dish in Greece. But this dish is also well known in Bulgaria as gyuvech (гювеч), in Turkey as güveç, and in the Balkans as djuvec. Accidentally, I bumped into the Greek giouvetsi during my honeymoon trip in Greece. Once I tasted it, I have loved it ever since! The word giouvetsi means ceramic pot and it is derived from the Turkish word güveç. Greek giouvetsi is a stew dish consisting of meat (lamb, beef, chicken, pork), pasta (kritharaki/orzo), and tomato sauce. The ingredients are well combined and then baked in an oven. Some cheese is often added just before it’s served. Giouvetsi takes a lot of time in cooking. The reason for this is that the meat has to be tender and of course it takes time to do so. Once it’s tender, you can add the other ingredients and bake it all together. The traditional giouvetsi is being baked and served in a clay pot while the modern version has different variations on how it’s served. Because of the long preparation, giouvetsi is often served as family food in the weekends. In the past, especially when not all Greek families had their own oven, cooking giouvetsi became a social tradition for Greek women. On a Sunday morning, Greek women would cook this delicious dish together with a communal, outdoor wood-fired oven. Later the tradition continued as Greek women prepared this dish in early Sunday morning and then brought it to be cooked at a local bakery for a few drachmae. Nowadays you can easily cook one up in your oven or find the dish in most restaurants in Greece. My first experience tasting this delicious food was in Athens, in a Greek tavern called Cave of Acropolis (Σπηλια Της Ακροπολεως, Θρασύλλου 24, Πλάκα – Αθήνα). They served their giouvetsi the traditional way, in a clay pot. I was so excited when I opened the lid and could smell a very yummy beef stew in tomato sauce. The cheese was quickly melting on the top of my stew and the meat was also very tender and divine. It was a great experience to taste this local delicacy. Have you ever tried giouvetsi or do you have a similar dish in your country? Then please share your experience in the comments.